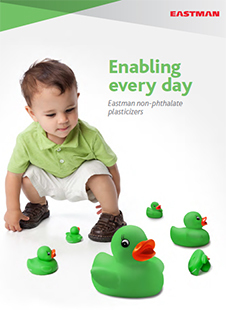 Eastman™ DOA Plasticizer, Kosher by Eastman Chemical Company is a bis (2-ethylhexyl) adipate. Acts as a plasticizer. It is a light colored, oily liquid with slight odor. Can be used alone or blended with other plasticizers, such as DOP or DOTP. Compatible with PVC, nitrocellulose, ethyl cellulose, most synthetic rubbers, and high-butyryl cellulose acetate butyrates. In PVC, it features flexibility at low temperatures, good electrical properties, good resistance to weathering and good stability to heat. 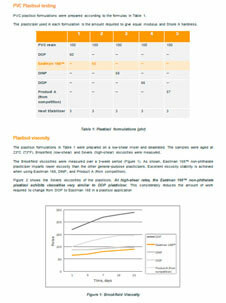 Used in clear films for food packaging applications. Eastman™ DOA Plasticizer, Kosher is compliant with TSCA (US Toxic Substances Control Act), DSL (Canadian Domestic Substances List), AICS / NICNAS (Australian Inventory of Chemical Substances and National Industrial Chemicals Notification and Assessment Scheme), MITI (Japanese Handbook of Existing and New Chemical Substances), ECL (Korean Toxic Substances Control Act), PICCS (Philippines Inventory) and IECSC (Inventory of Existing Chemical Substances in China). Manufactured under rabbinical supervision in full accordance with Jewish dietary law. Please note, these HSP values are estimations. It is based upon the “like seeks like” principle. It splits an ingredients interactions into three parameters; δD (Dispersion force interactions), δP (Polar forces interactions) and δH (Hydrogen bond force interactions). 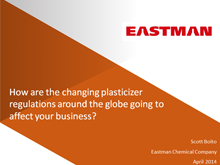 Hansen Solubility Parameters can help you find a wide range of products that are predicted to be compatible with Eastman™ DOA Plasticizer, Kosher. A practical determination of these HSP values would provide higher certainty. Learn More.